For the 70th Anniversary of the State of Israel, the European Leadership Network (ELNET EU & NATO), joined forces together with the European Jewish Congress (EJC), the World Jewish Congress (WJC), B’nai Brith International, the American Jewish Committee (AJC), the European Union of Jewish Students, the European Coalition for Israel (EC4I) and the Committee of the Jewish Organizations in Belgium (CCOJB). 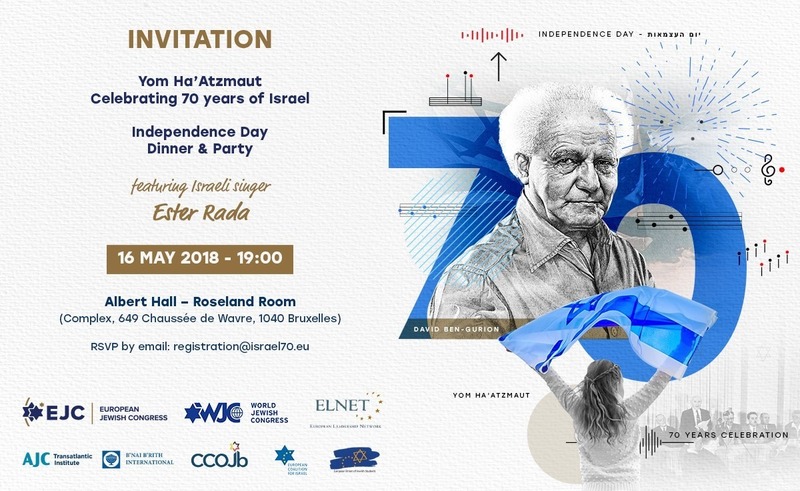 The celebrations took place on 16 May 2018, inviting more than 500 VIPs of the Brussels scene, notably main EU and NATO representatives, as well as the Jewish Community of Brussels and Antwerp. Over 200 people followed our invitation, including Members of the European Parliament across the political spectre as well as the most senior representatives of the European External Action Service (EEAS), the European Commission (EC), and the European Council, working on the Middle East, counter terrorism, and also more generally on foreign and security policy issues. Additionally, also numerous ambassadors, diplomats, professionals based in Brussels came together using this moment to get together, celebrating Israel, network and listen to the great performance of the renowned Israeli singer Ester Rada who was our special guest for the party after the official dinner. Before opening the buffet, each of the main contributors gave a short welcome speech. And welcomed the participants underlining the importance of EU-Israeli friendship today. The organizers, as part of the tombola, were able to work with several sponsors for the event, such as EL-AL who agreed to sponsor a flight ticket, as well as the Carlton Hotel in Tel Aviv who sponsored two hotel nights in Tel Aviv. The Israeli Mission to the EU & NATO sponsored a temporary Israeli exposition on the early developments to the high-tech society Israel is nowadays. After networking drinks and an official dinner, Ester Rada’s beautiful voice invited the participants on the dancefloor and brought the celebration to a memorable end.